The working year is quickly coming to an end, and that means some businesses may already be in the process of planning their first conference for 2018. If you’re in charge of planning, consider these creative ways to leave a lasting impression on your guests and make sure your next business conference is remembered for a long time. If the business element of your conference runs for long stretches of time, consider breaking things up with some live entertainment. Audiences will appreciate some light relief, and it also allows time to prepare in between speakers and presentations. Specialists in audiovisual installations can set up sound equipment for live music acts, and also provide microphones and speaker systems to ensure the whole audience can clearly hear what’s being said by speakers and presenters. The right even lighting can transform any space, whether you’re trying to turn a plain white room into a dynamic and engaging space to answer questions, or update a conference centre with spotlights to let the speakers shine on the day. 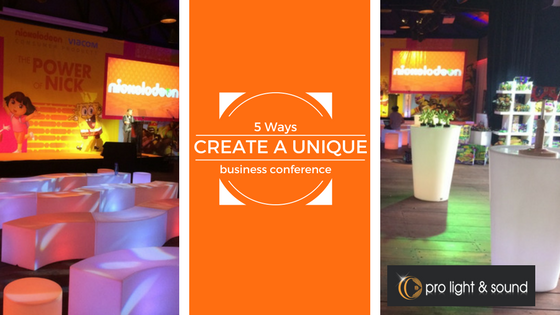 Event lighting hire can help make sure your conference is one to remember. Audiences can quickly tire of sitting in one spot and listening to speakers, so try and add interactivity to your conference. Audience participation is a great way to gauge peoples’ responses and reactions to what presenters are saying. Mobile phone apps and social media are great ways to receive and measure responses to ideas. You could ask audiences what they think about a certain idea or ask for feedback at the end of each day of the event. This interactivity also helps participants talk to each other and share ideas, promoting the formation of new relationships. Rapid-fire learning in the form of short, snappy presentations, panel discussions and debates can help keep participants’ brains ticking over. Speeches that drag on for hours are often forgotten post-event, whereas short, to-the-point presentations can leave a much more long-lasting impression. Advise keynote speakers they should work to a strict time limit and ask them to make their points early and succinctly. From the moment your guests arrive at the car park, through the entrance and into the conference space make the experience a branded one. Using an event stylist can help you create an atmosphere that will engage your guests and showcase your brand. Lighting, draping, screens, customised rigging will help you enchant your audience. Get in touch now and start planning your next business conference to create a unique experience that your guests will remember for years to come.